I love using eyeliner, and I usually use different color kohl’s. I have nearly every color from MAC – they have the best colors and are so good for blending. One thing I didn’t have was a really good liquid liner that gives you that really sharp defined line, I love the way Angelina jolie does hers. The reason for this is I don’t really have a steady hand and because of this it never looks right. 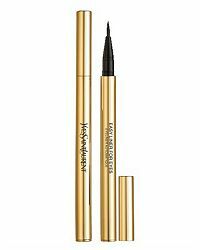 Then I read about YSL Easy Liner which looks a bit like a felt tip pen (but with much nicer packaging!). I rushed out to buy it and was lucky enough to get the last one, so I think they are in high demand. I got it from Bentalls in Kingston for £19.00, but have also seen it available from Boots at the same price. So it’s not the cheapest, but I do feel it was worth the money, as it’s so unbelievably easy to use, and looks fantastic. I think the main reason it’s so good is it doesn’t let out a whole lot of color at a time, so it doesn’t run at all, you just need to build the color up gently which is so easy to do, and really does take no time at all.